There are high requirements for disinfection and maintenance of spa water and therefore also extra high requirements for water care products intended for spa baths.The high water temperature means that microorganisms and bacteria can thrive extremely well. And because the water is filtered and reused continuously, additional disinfection is needed. As a spa owner, you must be sure that the hygiene is in order.Activ SPA is a product series specifically designed to give you the peace of mind. Simple and effective test kit to determine the water’s current pH value and content of active oxygen..
30 pcs. Red Phenol tablets and 30 pcs. 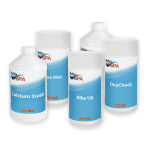 DPD 4 tablets for refilling the Activ Pool Test Set PH/Active..
Spa pH DOWN lowers the Spa water's pH value in outdoor and indoor spa baths. Instructions for use: .. In especially spa bath, the pH value can sometimes be difficult to keep on a stable level. When refi.. Liquid hardness stabilizer that prevents calcium precipitation and calcium deposits in the spa water..
Spa chlorine granules 56% are used for efficient disinfection of the bath water in indoor and outdoo..
Spa OxyChock is used for efficient chlorine-free shock disinfection of bath water in indoor and outd..
Activ SPA Filter Cleaner is used for cleaning filters in outdoor hot tubs. A spa filter effectively ..
For cleaning pipe systems in spa bath. Inside the tubes, deposits of body fat and dead skin cells ar.. In the spa, unwanted foam can sometimes be formed on the water surface. The foam normally comes from..
Activ Spa Tab 5 is a fast-dissolving tablet that ensures water hygiene in a spa (both indoor and out..
Activ Spa Tab 10 is a fast-dissolving tablet that ensures water hygiene in a spa (both indoor and ou..
Activ Spa Tab 1 tablets ensures effective disinfection of bath water in smaller spa baths with 100-2..
Activ SPA OxyBooster is always used in combination with Activ SPA OxyChock when the pool water is di..
Porcelain, Glass, Ceramic and Acrylic Here is the cleaning cream that gently and efficiently cleans..
Invisible protection of porcelain, ceramics, glass and acrylic Magic Shield is an invisible, non-st..